Died: 12th March 1915; age 34; KiA – Battle of Neuve Chapelle, France. Frederick Cobb, 40, a Police Constable, born Scole, Norfolk. Christiana Cobb (nee Cooper), 41, born Billingford, Norfolk. Frederick Cobb, 13, born Ipswich. Thomas James Cobb, 11, born Ipswich. Albert Cobb, 9, born Ipswich. Christina Cobb, 7, born Westerfield, Suffolk. Ernest Cobb, 4, born Westerfield. 1891 4, Suffolk Road, Ipswich. Frederick, 47, a Police Constable. Christiana, 48, a Tailoress – own account. Albert, 19, a Shepherd on a Farm. Ernest, 14, an Agricultural Labourer. Charles Cobb, 6, born Westerfield. 1901 61, Norfolk Road, Ipswich. George was 22 and a Labourer – Iron Foundry. He was living with his parents & siblings. Frederick, 58, a retired Police Constable. Ernest, 24, a Foundry Worker. 1911 61, Norfolk Road, Ipswich. George was 31 and a Painter – Agricultural Works. He was living with his parents & brother. Frederick, 68, a Police pensioner. Charles, 27, a Police Officer. Soldiers’ Effects to Mrs. Maude Rayner – sister. 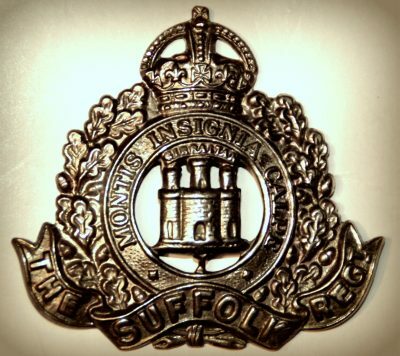 George is also remembered on the war memorial at St. Margaret’s Church, Ipswich and the Orwell Works Memorial Ransomes Sims & Jefferies Ipswich.